The Good: The definition of ‘control’ by a private foreign investor, which is the only sort of investment that the law covers, retained its clear standard from the earlier draft. The definition of control includes 50% ownership of a company’s share, the ability to appoint 50% of the board of directors, control by contract, or becoming the manager of the company. The rules for companies working with strategic mineral deposits are more strict – anything over 10% ownership is scrutinized. There were some concerns earlier that the final version of the draft would not include a de minimis metric for control, as I mentioned in the previous version of this post. The [Not So] Bad: Some natural monopolies were removed from the list of ‘strategic’ industries, but the majority are still there. The industries that were exempted, including the electric grid and regional telecoms, are perhaps the most in need of foreign investment. Keeping these businesses open for foreign ownership will help Russia upgrade its infrastructure. Companies working with strategic subsoil deposits were also added to this draft. The PM [hint hint] will head the government body that makes the final decision on proposed acquisitions. As much as you may criticize Putin, I think he is probably the best, and maybe only, figure in Russia who can resolve disputes over these sorts of high-profile deals. The Ugly: The latest draft includes radio, television, newspapers, and fishing (yes, fishing) as strategic enterprises. Now, the inclusion of television/radio is limited to those stations that reach at least half of the Russian population and only applies to periodicals with a distribution of 1 million or more. Still, the designation of media outlets as ‘strategic’ is a bit of a stretch. Finally, fishing? Perhaps this relates to President Putin’s love of the sport? There is always the possibility that the law will be amended before the vote or that the Duma will ask for more changes. Still, I think that the new law, for all its faults, will be good for foreign investment in Russia. In theory, the law is even more transparent and predictable than its U.S. counterpart – the Exon-Florio provisions. And the removal of some natural monopolies from the list really appears to be a compromise between the liberals and siloviki, as German Gref opposed their inclusion from the beginning, whereas the siloviki wanted all natural monopolies to be covered. Update: The Duma has approved the legislation in its second reading, and most observers expect that the law will not change much from now until its final passage. 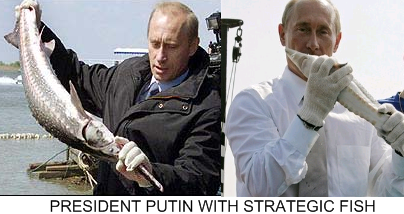 This entry was posted in duma, fish, legislation, Putin, strategic industries. Bookmark the permalink.